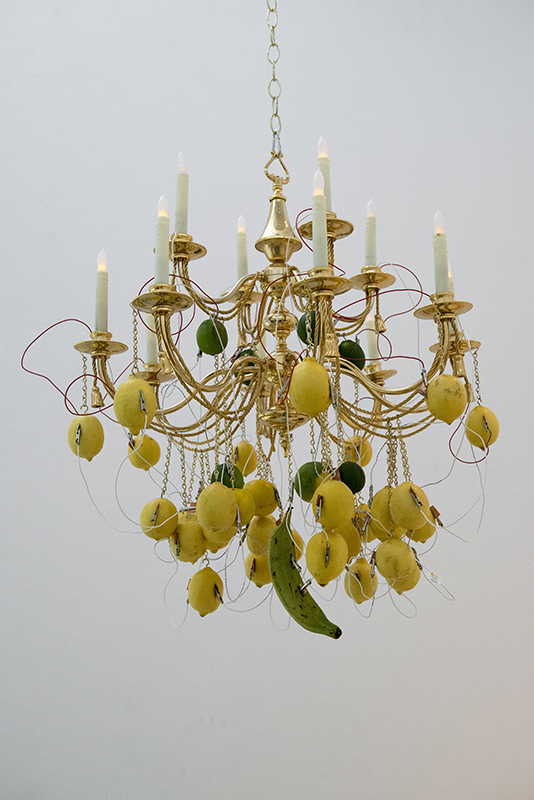 Nom Nom Ohm: When Life Gives You Lemons, Make Chandeliers is an installation by Jessica Segall that features two chandelier light fixtures powered by the unlikely source of produce. The antique chandeliers are illuminated using products bought from Essex Street Market vendor Viva Fruit and Vegetables. The pair of opulent chandeliers were rewired to use the unidirectional flow of electrical charge, or DC power, to collect all of their energy from the humble source of market-bought fruit. As is often the result of Segall’s practice, this installation leverages the allure of a striking visual experience to seduce visitors in order to bring awareness to the simple means by which environmental responsibility can be attained. 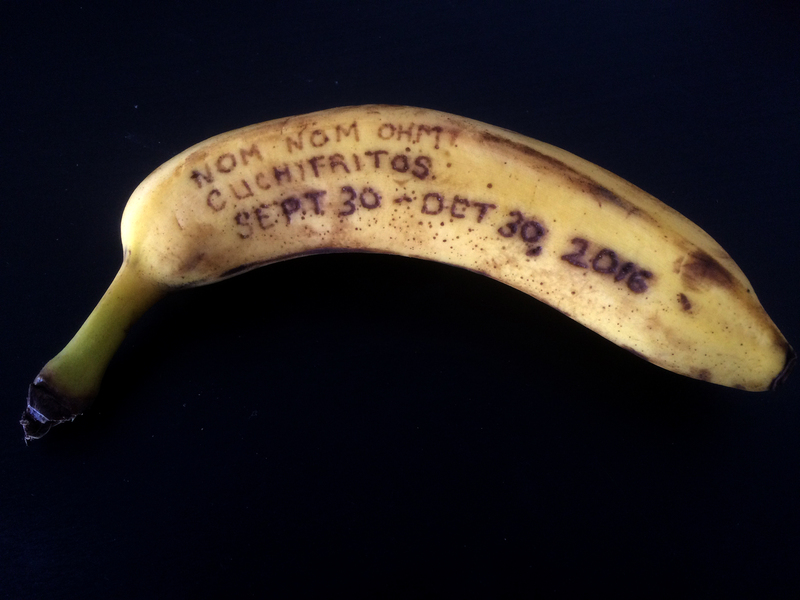 Reminiscent of the classic potato clock displayed at student science fairs, Nom Nom Ohm dilates this experiment to an elaborate extreme. 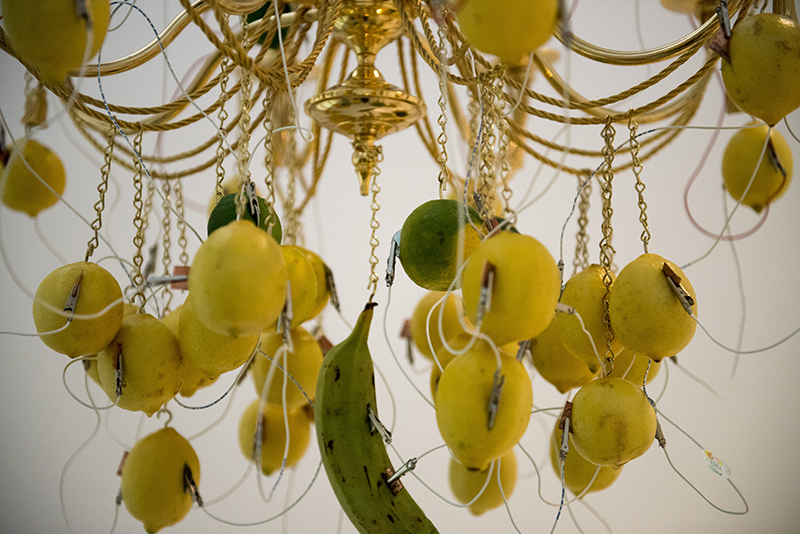 The chandeliers, illuminated by the electrolyte-rich fruits, behave like a modern day vanitas, mimicking earlier genres of still life painting that aimed to reflect on the transience of desire and decay. To maintain power, the fruit is replaced periodically as it wilts over time. 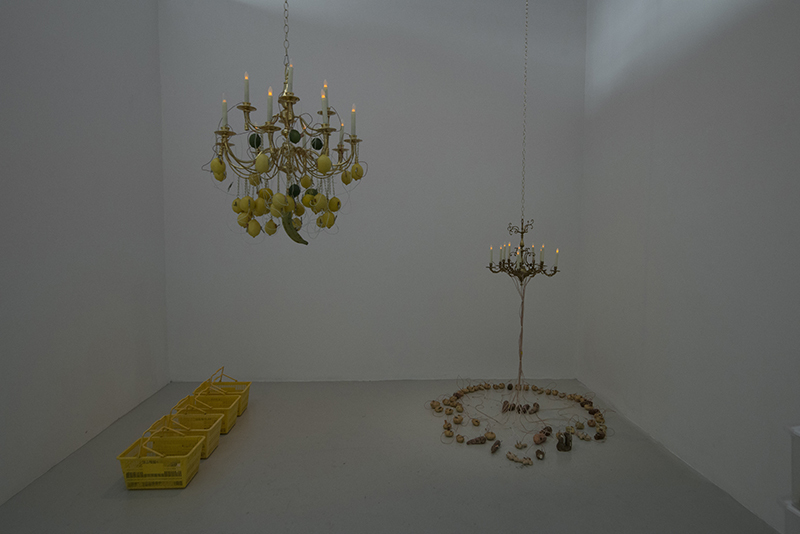 As a means to illustrate the amount of material needed to adopt this approach of power sourcing, the discarded fruit will remain on display in the gallery as a visual representation of the bio-matter necessary to power the chandeliers for the installation’s duration. 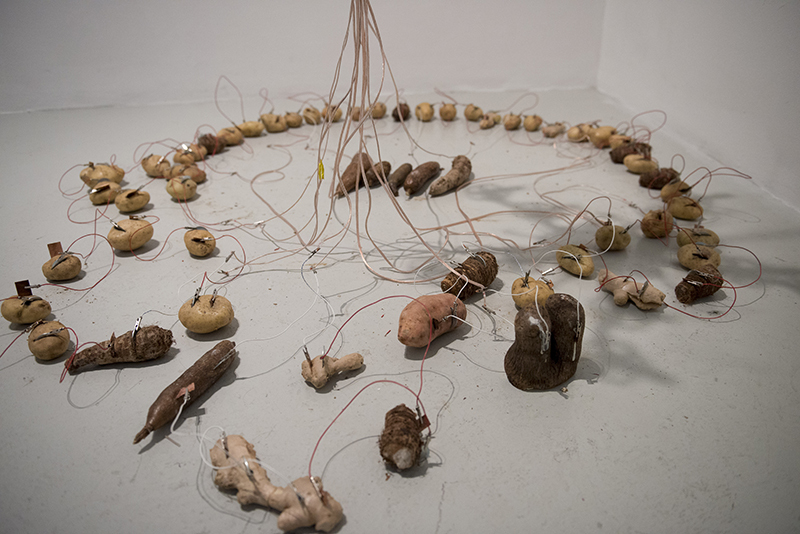 At the close of the exhibition, all of the produce used throughout the project will be donated to the Lower East Side Ecology Center’s compost program. Special thanks to Essex Street Market vendor Viva Fruits and Vegetables for supporting this installation. Jessica Segall is a multidisciplinary artist living in Brooklyn. Her work is exhibited internationally, including the Havana Biennal, the Aldrich Museum, The National Gallery of Indonesia, The Queens Museum of Art, The Inside Out Museum, and The National Modern Art Gallery of Mongolia. 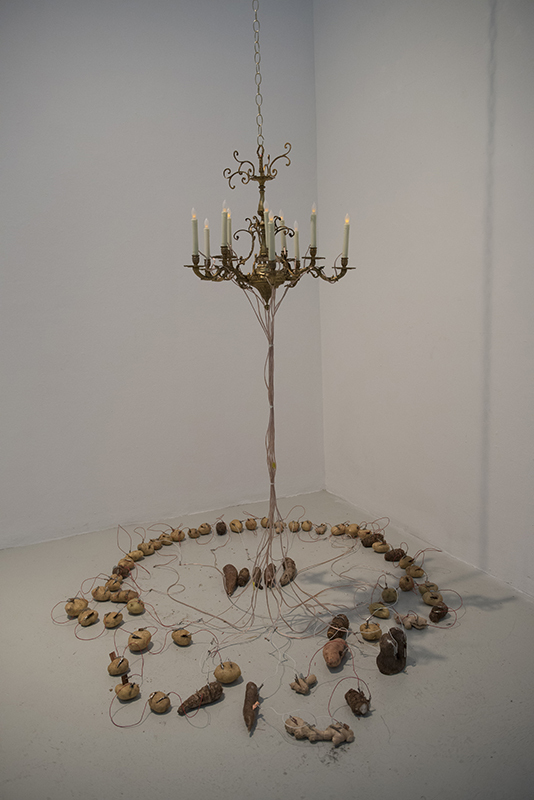 She received grants from NYFA, NYSCA, Art Matters, The Rema Hort Mann Foundation, the Leighton International Artist Exchange Program and attended residencies at Skowhegan, The MacDowell Colony, Art OMI, Bemis, SOMA and The Sharpe Walentas Space Program. She is a graduate of Bard College and received her MFA in 2010 from Columbia University.